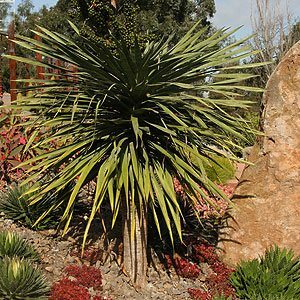 The Dragon Tree or Dracaena Draco is widely available from wholesale growers across Australia. With a strong architectural look and a tidy growth habit it is available as a single branching specimen as well multi branching types. The crowns are foliage dense, blue green and strongly upright. Dracaena Draco is very low maintenance plant, it requires little extra water once established, and needs fertiliser only once a year in most cases. The plant will flower and after flowering they tend to branch. Flowers are insignificant although they are followed by prominent orange to red berries. Dracaena Draco does not drop much foliage which is an advantage. Used widely as a specimen plant, suited to growing around swimming pools to create a tropical feel.Also suited to growing in containers.